"Whereas the MX TVs we produce today look the same on the outside as those we produced in the mid-1980s, they are completely different on the inside", states Torben Ballegaard Sørensen, Bang & Olufsen President and CEO. BeoVision MX8000 is a 66cm (viewable screen) television and was introduced in October 2002 as a replacement for BeoVision MX6000 and MX7000. Based around the BeoVision 1 chassis, BeoVision MX8000 is brought up-to-date with the following options: Master Link (either as Master or Slave), RF Modulator (if used as Beolink® master), Set-Top Box Controller (with full on-screen graphics), Anti-Reflex coated contrast screen and Dolby Digital Surround Sound (including DTS). A camcorder connection is placed below the screen where the manual control on previous MX televisions was situated. In 1984, when the MX range was introduced with BeoVision M20 (the forerunner of BeoVision MX2000), TV sound was produced by passive log-line loudspeakers, producing either stereo or mono sound. Whether coming from a television programme or VHS, Betamax or Video 2000 VCR, it was only experienced as coming from the TV itself. Today, multi-channel surround sound systems provide enveloping sonic experiences in the home. Back then the user listened to two 7-watt speakers in the TV itself. Today six powerful active speakers are becoming more and more popular. 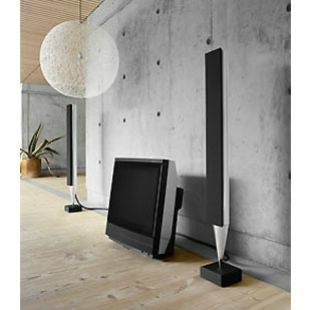 In 2002, important dialogue emerges from the powerful active loudspeakers which, following the original MX design, are sill located directly below the screen. Thanks to Bang & Olufsen’s active loudspeaker technologies, BeoVision MX 8000 delivers a sound pressure level capable of equalling many hi-fi systems. Multi-channel sound experiences covered too, as the build-in multi-channel digital surround sound module allows the connection of several external BeoLab loudspeakers, such as the BeoLab 8000 or BeoLab 6000. Big bass effects remind you of a trip to the cinema once you’ve connected a BeoLab 2 subwoofer, an 850-watt low-frequency producer to highlight the thrills and spills of a large-screen auditorium. "With the BeoVision MX range, television becomes a versatile feature that assimilates into your home and lifestyle." BeoVision MX makes TV a discreet part of your interior decoration. Uncompromising sound and picture quality come as standard. With the BeoVision MX range, television becomes a versatile feature that blends into your home and lifestyle. BeoVision MX TVs fit where they’re wanted. BeoVision MX 8000 is ideally suited for standing alone or being used on a motorised stand. TV sound is driven by powerful 40 watt active stereo loudspeakers. The Dolby® Digital surround sound module is a new optional feature that allows the MX 8000’s existing speakers to act as centre channel in a surround sound setup. Connections to Bang & Olufsen's DVD 1 and Beocord V8000 VCR are undertaken simply and easily; BeoVision MX 8000 also features the ability to serve as a Beolink® master, distributing sound and picture throughout the home. Operation takes place via the Beo4 remote control. There are three placement options - a stand (with optional shelf for DVD 1 or Beocord V8000 - as in above picture), a motorised floor stand and a motorised base. It also has its own in-built stand to tilt back the set (as in BeoVision MX4000/4002). "The device appears as a well-formed cabinet from the front. From the rear, the encapsulation of the picture tube is so well done that the device may be enjoyed from all angles. The stacked-build of the device makes it possible to place it in a corner… Technically it contains many new functions, including the integration of a contrast screen that reduces disturbances from incoming light." So wrote The Danish Design Council when presenting their 1986 ID prize for exceptional design to David Lewis and Bang & Olufsen for the BeoVision MX 2000. Launched in season 1984/85 as BeoVision M20, the basic conceptual elements of the BeoVision MX exist virtually unchanged today. Now in 2002, many similar words could be used when describing the 30th member of the BeoVision MX family, BeoVision MX 8000. The 28" model features the latest technologies of today within sound and picture reproduction; including an optional 5.1 channel digital surround sound module and Bang & Olufsen’s own VisionClear system. On the screen, the blue waters and green rainforests of the tropics appear as truly blue and green, rather than shades of a similar colour. Bang & Olufsen’s patented picture quality elements, known collectively as VisionClear, ensure your visual experience contains the correct balance of sharpness, brightness, saturation and black level, allowing you to enjoy the programme instead of fiddling with the settings. The optional anti-reflection coated contrast screen, mounted in front of the picture tube, reduces the amount of incoming light by up to 99%, ensuring that you’re not disturbed by unwanted shadows or reflections. Another central element to the MX concept is modularity. Numerous placement, connection and build-in possibilities combine to offer a large degree of freedom within the same concept. Either standing freely on the floor, placed on a dresser or on a motorised stand, your BeoVision MX 8000 can show up where you prefer, rather than dictating where it should be placed. Connecting to Bang & Olufsen's DVD 1 and Beocord V8000 videotape recorder takes place simply and easily, and BeoVision MX 8000 also features the ability to serve as a Beolink® master, distributing sound and picture throughout the home in B&O’s popular distribution system. Operation of all products takes place via the Beo4 remote control.